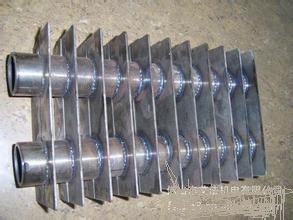 In recent years, the H type finned tube economizer is widely used. The earliest boiler in europe. Subsequently, Japans major boiler manufacturers recognize that this new type of coal has many unique advantages, but also to the capacity of up to 1050MW ultra supercritical coal-fired units, and achieved good results. In our country, as early as in the last century 90s this kind of coal is used in some imported boiler units. For example, before 2000 in Dalian, Fuzhou, Yueyang and Liaocheng, Heze 300/600MW imported coal units on the use of the H type finned tube economizer. 2000 has also been used in Yaomeng Power Plant Boiler No. 1 renovation project. After 2002, China began to build a large number of supercritical 600MW units. With the introduction of foreign technology, the H type finned tube economizer is used. Huarun Changshu power plant on the first use of 600MW supercritical boiler, and then a number of supercritical and subcritical units are widely used.